2 What is Subungual Melanoma? Melanoma is a kind of skin cancer that begins to grow in the cells comprising of skin pigments called melanocytes. When melanocytes start to collect, it results in the formation of moles that may turn cancerous. In case Melanoma is not treated timely, cancer might spread to other organs. Melanoma usually occurs when an individual is exposed to the ultraviolet rays of the sun. Subungual Melanoma is a rare condition of Melanoma under the fingernails. Unlike other skin cancers, it occurs on the nail bed, known as the nail matrix, which helps in protecting the underlying skin. It causes the nail to discolor and is characterized by dark brown or purple color appearing as a streak of dark pigmentation that results in thinning and ultimately breakage of the nail. It is often seen on the big toe or thumbnail. However, it may occur in any nail of the foot or hand. It is noted that 1% – 5% of all melanoma cases are of Subungual Melanoma affecting the fingernails of both males and females. It is most common in Asians and those of the African-American descent who are intensely pigmented. It is largely found in people within the age group of 60-70 years. It is however rarely seen in children. This form usually is non-malignant but if cancerous can prove harmful leading even to death. 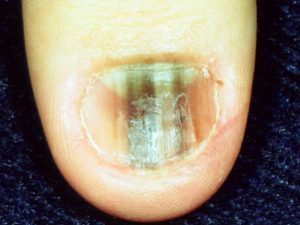 In most cases, a dark patch appears underneath the nail. Many females may not be able to see the initial signs if they wear dark shades of nail paints. In its early development, it looks like a mole on the skin which is caused by the sun rays. Diagnosing this form of cancer is difficult which is why it is highly recommended to consult a doctor immediately after noticing any patch or any unusual growth on the nails. The doctor needs to examine the region of the nail and the lesion carefully. Dermatologists may use an instrument called a dermascope which helps them to get a magnified view of the affected nail and its surrounding area. But in a few cases, visual inspection may be harmful as it may be confused with other disorders like the subungual hematoma, onychomycosis. A biopsy is known as a punch biopsy is a tubular instrument containing a sharp end that acts like a cookie cutter that collects the sample. It enables the doctor to look for other fungal infections apart from melanoma. For advanced melanoma suspicion, the biopsy associated with the excision is undergone to remove the entire part of the nail along with its surrounding tissue. People who prone to get affected by risk factors do not immediately get affected by this disease. But they bear the risk of suffering more than the ordinary ones. Hence they should be more careful with the early symptoms and readily visit a doctor. Similar to other cancers if not treated timely it can spread to other parts of the body. Melanoma affects other organs causing life risks. 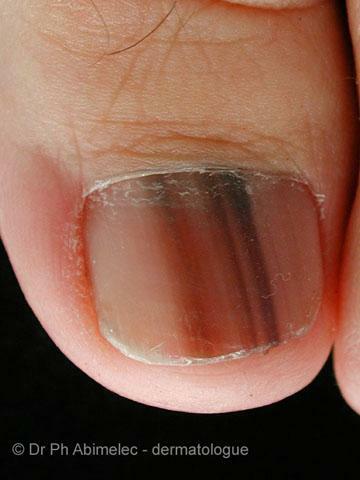 At times, the doctor may suggest an amputation to be done on the finger or the toe on which the nail gets pigmented. However, compared to this, surgery is more advisable. The preferred method to get rid of Subungal Melanoma is to adopt a surgery. The doctor firstly removes the entire nail affected and then it can help him to discard the cancer development thoroughly. But again, this depends on the intensity of the disorder verifying on what stage it is and how complicated can it get. Initially, if the depth is less than one millimeter, then the doctor usually undergoes local expurgation. It can help to control the development of cancer. In case, it is wider and dangerous, an excision is required along with the biopsy of the lymph node. It is needed to conduct the nature of the melanoma and reduce the risk of spreading to other organs through medications and proper methods. But if the melanoma is too advanced, then the affected finger or toe needs to be operated and removed. Thus all of the cancerous element presents can be expurgated entirely and thereby no further complications can arise. Unfortunately, if the surgery does not work, then the last option is to undergo chemotherapy and use of prescribed medicines to kill cancer in the cells of the affected area or anywhere surrounding it. However, till date, the most viable option for the cure of this melanoma is surgery.